ABOUT THE BUSINESS: SellingRestaurants is proud to bring you an attractive and nearly new New York style pizzeria that's making money NOW! The restaurant is priced to sell fast! It is selling for 1.6 times 2011 adjusted net income (August 1 2010 - July 31, 2011). This business is highly successful and sits in a AAA location with high volume foot traffic as well as a monument sign on a major street. It is positioned near other businesses that attract a continued flow of return customers. It has an open kitchen where the pizza's are made along with a beautiful build-out and display area. And the PIZZA IS TRUELY GREAT! REVENUE AND PROFIT: This Pizzeria utilizes a combination of revenue streams including sit down dining experience, take-out and delivery. The owner claims last year’s adjusted gross profit of $112,800! This has not been verified by the Broker and the buyer should perform their own due diligence to verify the result and not rely upon the representation made by the Seller or Broker. THE EQUIPMENT: There is a Class 1 and Class 2 hood system in the kitchen. 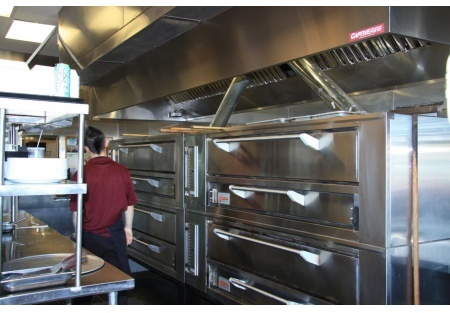 This store is only a couple years old and the equipment is in excellent condition including four Marsal Pizza ovens to handle high volume. There is extensive equipment in this sale, perfect for efficient pizza operations and display to your customers. All equipment is in use to support current operations. LEASE: With approximately 2,300 Sq. Ft., there is plenty of space to serve existing and new customers with seating for 60 inside and 20 outside. This is an ideal choice for being in business on day one and making money. REASON FOR SELLING: Family relocating back to New York. GET THE NAME AND ADDRESS: To get the name and location, select the orange button "contact agent" below. Opens 10:30am. Closes 9pm weekdays and 10pm weekends.